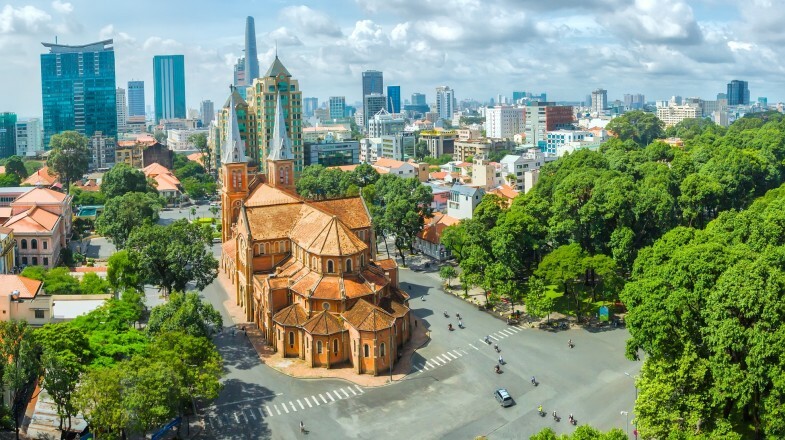 As Vietnam’s largest city and the previous capital of the old Republic of Vietnam, Ho Chi Minh is still known by its old name, Saigon. Nowadays a visit to Ho Chi Minh or Saigon will bring you to a city full of a chaotic energy. While its troublesome past has been carefully recorded, commerce is booming and a fresh culture is being cultivated. All to create one of Vietnam’s most exciting cities. Sample traditional Vietnamese food at the Ben Thanh market, where you can also find interesting and inexpensive gifts, souvenirs and general wares. Immerse yourself in Chinatown. Full of temples, medicine shops and, of course, food! Visit the red-brick Notre Dame cathedral, built in the late 19th century, an unexpected sight amongst so many golden temples. Visit the 48th floor Saigon Skydeck at the Bitexco Financial Tower at sunset, you won’t be disappointed. The Museum of Traditional Vietnamese Medicine is an interesting alternative to history museums. If this interests you then make sure to head to a traditional herb store. If the city if becoming a bit too much, escape to Can Gio island. The beaches of the islands are a welcome respite from the city’s chaos. Enjoy the delicious and nutritious Vietnamese street food. From noodle soups called pho (pronounced as ‘fuh’) to Bahn Mi, a Vietnamese sandwich, it will save you money while giving you a real taste of Vietnam. Beware of pickpockets while wandering the many markets of Ho Chi Minh. Bargaining is common here, but be confident and firm with market sellers who can often be quite insistent. Always dress conservatively when visiting religious sites. When finished eating, place chopsticks across the top of your bowl to avoid causing offence or gaining bad luck! Make sure you have all the relevant vaccinations for Vietnam before you travel.